The God of the Gaps has His eye on Dover, PA. The Dover Area school board now requires that science teachers include intelligent design theory -- ID -- in their lessons as a counterpoint to evolutionary theory. That requirement has caused a group of parents to take the board to court arguing that ID is not serious science, but a Trojan Horse for sneaking God and religion into public schools. The continuing debate about separation of church and state is important, but the thing about ID is that it's not a scientific theory in the first place. 1. Theories and techniques need not have been proven, but they should have been tested and not falsified. Thus, for a start, theories must be testable and falsifiable. 2. Theories and techniques should be subjected to peer review and publication -- communication and criticism are vital to modern science. 3. Experimental techniques should have a known error rate. Any test of a theory should have an attached confidence level. What good is a test result if you don't know how reliable the test itself is? 4. Theories should be subject to standards governing their application. Thus, independent groups in a field should be able to share experimental results in a meaningful way. Everyone should play by the same rules. 5. Theories and techniques should enjoy acceptance by at least a significant minority of the scientific community. On all five points, the frontrunner concept of ID, irreducible complexity, strikes out. On Monday, ID advocate Michael Behe testified for the defense of the Dover Area school board. Behe's rallying cry is the concept of irreducible complexity, which is based on the notion that the intricate workings of organisms, especially on the molecular level, rely on separate but interdependent parts. Irreducible complexity supposes that each part would have been useless without the others, and so none of the parts should have evolved out of a passive process like natural selection. Thus, collections of special, coordinated parts may be the signature of an Intelligent Designer. 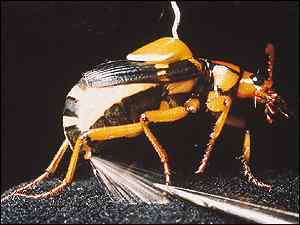 Bombardier beetles, which produce and store separately the chemical ingredients for a dramatic, explosive spray, are poster children for irreducible complexity. For this concept, the problem with testing and falsification is that the 'experiments' have already taken place that gave rise to the irreducibly complex features that Behe observes today. Nobody knows just how those experiments were conducted and whether there was a Designer guiding the process or not. Asking scientists to re-evolve by natural selection beetles equipped with explosive sprayers might falsify the concept by showing that natural selection is indeed powerful enough to yield complex interdependencies. But who's to say that the Designer wouldn't be tinkering behind the scenes the second time around? And anyway, the beetles' evolution took billions of years the first time around. With testing out of the question, a test error rate becomes meaningless. Strike two. While Behe has been published for his work on protein evolution, there is no peer-review discourse on ID experimentation. Without journal literature, there has been no establishment of regular practice for work on irreducible complexity. Not surprisingly, then, the biology community has been generally unimpressed with the notion of irreducible complexity. For example, Ken Miller, coauthor of a widely used biology textbook, wrote in his book Finding Darwin's God, "Behe is wrong." Strike five. Since its modern inception, in Ferdinand Canning Scott Schiller's 1903 book, Humanism, ID has been doomed to fail as good science. Schiller writes, "It will not be possible to rule out the supposition that the process of evolution may be guided by an intelligent design." Thus it will not be possible to give science a fair go at ID and the concept will not fuel constructive discourse. In a way, the case of the Dover Area school board is, well, academic. Even if the board is allowed to require ID in science class, the subject will never be science and it will never make a good counterpoint to evolutionary theory. ID won't even make a good lie to children.